Did you know there are many ways to show your support? 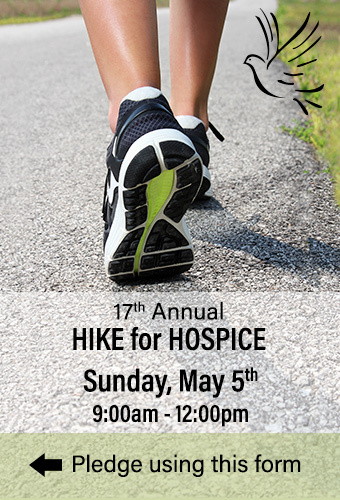 Pledge a friend, family member, or a team of hikers! Did you know that 80% of Canadians say they want quality hospice palliative care at the end of their life, yet less than 15% have access to it? Your fundraising dollars will go towards providing physical and emotional care to the terminally ill and ongoing bereavement support after the death of a loved one. Your support means so much. Through your generosity, our dedicated staff and volunteers can continue to develop, deliver and share our important Hospice Society programs and services with the community. Please specify the name of the hiker(s) or the name of the team to which you would like to pledge. A tax receipt will be sent to the donor address specified in Step 1 above. If you wish the tax receipt to be sent to a different address, please indicate below. Confidentiality and information security policy. Online donations and membership fee payments with Peace Arch Hospice Society are secure. Peace Arch Hospice Society complies with SSL encryption standards, under which transaction information will always be transmitted securely. Payment is made through PayPal. If for any reason you require a refund of your donation, please contact the office of the Peace Arch Hospice Society at (604) 531-7484. Refunds will be processed within 15 days of payment. Looking for the registration page?